Leave a great taste in your customer’s mouth! Our gourmet fudge is smooth, creamy and made with real butter! WeDo Fudge of Sequim, Washington offers a variety of delicious flavors. Try one or more of our samples and taste for yourself; our fudge is excellent, a perfect complement to your GREAT BUSINESS! WeDo Fudge offers a variety of popular flavors along with several flavors for each season. The most popular flavors are: Chocolate Walnut, Dark Chocolate Caramel Sea Salt, Dark Chocolate Pecan, Mint Chocolate Swirl, Peanut Butter Chocolate and Turtle. Because our fudge is made to order, we can assist you in coming up with a specialty flavor just for you. To help our customers really make an impression, we have established a private labeling program using a graphic of your choice. We will design a label FREE of charge to customize your fudge. 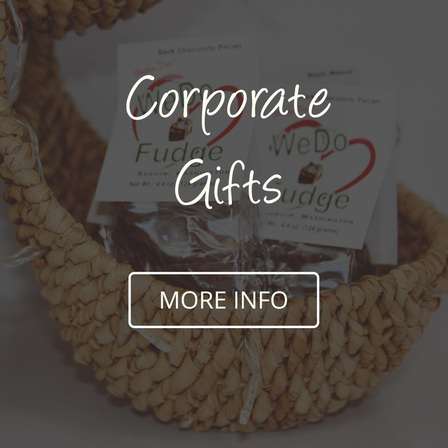 Your logo will replace the WeDo Fudge logo on the front of the package. We are privileged to share that WeDo Fudge was founded upon the truth that God is the creator of the universe; that man is eternally separated from God due to sin and is saved through His Son, Jesus Christ, as both Lord and Savior. Because of this belief, we decided to share our faith by putting an encouraging Bible verse on a beautiful picture from the Pacific Northwest in every package of fudge. We recognize that not all of our wholesale customers will want Bible verses in their fudge. To accommodate our customers’ wishes we offer either private labeling with or without Bible verses or WeDo Fudge labeling with Bible verses.